San Miguel Holdings Corp. (SMHC) has submitted an unsolicited proposal to extend the Tarlac-Pangasinan-La Union Expressway (TPLEX) by 100 kilometers to reach the Ilocos provinces, according to a report by The Philippine Star. According to the news item posted on May 30, San Miguel Corp. President Ramon Ang said the proposal is now pending with the Department of Public Works and Highways (DPWH). However, the project is yet to be posted on the agency’s website. Ang did not disclose how much the project would cost. The original TPLEX, an 89.31-kilometer expressway from Tarlac City to Rosario in La Union, is funded and managed by Private Infra Dev Corp., an SMC subsidiary. A company official said the proposal is to extend TPLEX up to Laoag City in Ilocos Norte province. If both DPWH and the National Economic and Development Authority approve SMC’s new proposal, the company will be given original proponent status before it goes through a Swiss challenge, which gives other private parties the chance to match or offer a better proposal. Ang’s announcement comes months after SMC submitted an unsolicited proposal that also hopes to extend TPLEX to the municipality of San Juan in La Union. 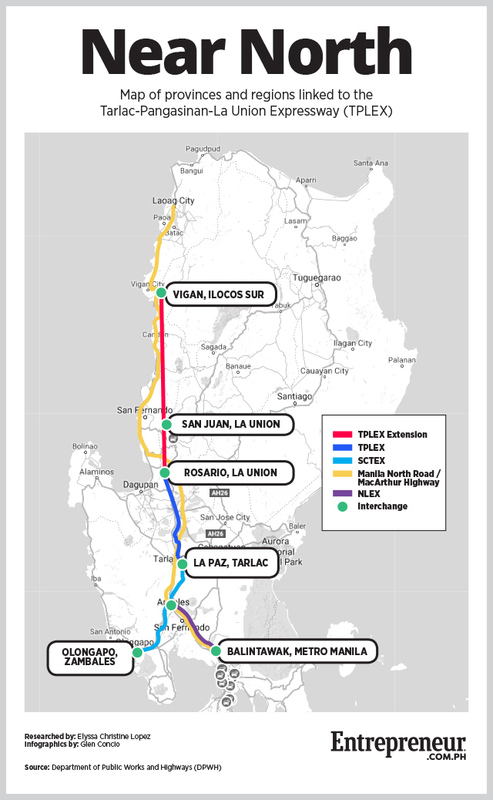 The project involves building a four-lane toll road covering three segments in La Union province starting from the last exit of the current TPLEX: an 18-kilometer stretch from Rosario to Tubao, a 23-kilometer extension from Tubao to Naguilian and an 18.4-kilometer road from Naguilian to San Juan. SMC's proposals come a year before the last section of TPLEX opens to the public. Currently, the original TPLEX, which started construction in 2010, has still yet to be finished. The last section of the project, which entails the completion of the last section of the expressway from Pozorrubio in Pangasinan to Rosario in La Union, is expected to open to the public by June 2019.